Successfully Added Condor - Android 2.3 Phone with 3.5 Inch Capacitive HD Touchscreen (3MP Camera, Dual SIM, WiFi) to your Shopping Cart. 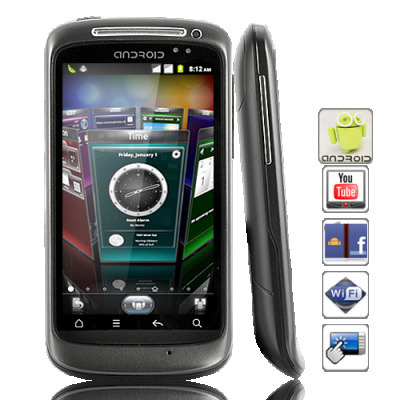 Work, life, or play - fully satisfy your every need from a mobile device with the Condor Android Smartphone. Featuring the power of Android 2.3 and a high-definition 3.5 inch capacitive touchscreen, the Condor is brighter, faster, and just plain better. In the tough and competitive scene of wholesale Android smartphones, the Condor truly stands above the rest. To start, it uses a quick and responsive 3.5 inch capacitive touchscreen that responds immediately to your touch, allowing you to slide your finger across the smooth screen and easily navigate through web pages, photos, eBooks, and games. The screen itself also shows its 800 x 480 resolution, which displays detailed and full of life images, making media and gaming that much better. With the Android 2.3 operating system, the Condor smartphone comes with everything you need to organize and manage your personal and work lifestyle. You have easy access to your Google Calendar, Email, Word/Excel/PPT, and other vital sections of your task flow. You can even keep connected with all your friends, family, and colleagues with the integrated applications like Facebook, MSN, and many other IM applications. Further more, stay up to date with the news and get on demand entertainment from Mobile TV, YouTube, Music and Radio. To top it all off, with the Android Marketplace you have access to hundreds of thousands of both useful and entertaining applications and games, most of which are free! Spread your wings with the Condor Android smartphone and enjoy all there is to offer. From the smooth Android 2.3 operating system to the vibrant 3.5 inch HD touchscreen, it's near impossible to find an Android 2.3 smartphone of this caliber for such a low wholesale price. Order today and we'll ship it out to you tomorrow. on 2012-06-04 10:07:30 Love It! every since I've bought this phone I never had any problems camera is also great'cant beat it for the buck buy it and you will see.